Following 2 years of recouperation from hand, then shoulder and knee surgery, I am glad to say that I will be holding a Solo Exhibition this year. It will be in October at that gorgeous gallery in New Farm , Brisbane . More details to follow ..
Its Advent - preparation time leading up to Christmas and in reflection it has been a quiet year for me and my work. ... I have not been able to paint for much of this year due to injury and shoulder reconstruction surgery mid year taking six months to recover fully and had to cancel my solo exhibition - but I believe there are blessings in everything and I have so much to be grateful for:- friends, family, food, a roof over my head, my faith and freedom to express myself - basic human rights, not everybody gets to enjoy. Thanks for your ongoing support and Peace and Goodwill to all this Christmas. SPRING ART NEWS Spring is the air, flowers are blooming, the air is crisp and clean and something's about to happen. Right from the start of this year I intended to focus on painting commissions (I had several following my solo exhibition last year), which meant I wouldn't be able to prepare for a solo exhibition this year as well. However Mother nature decided to intervene, with my painting hand needing a rest (and a minor operation and numerous physio visits). I haven't been able to paint as much as usual, but the ideas keep flowing. 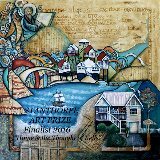 "HOME and the THOUGHT OF KELLS" has been selected as a FINALIST in the STANTHORPE ART FESTIVAL ART PRIZE. I've been invited to be special guest at this year's historical celebrations. 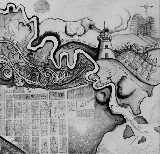 My work will be displayed at the Commissariat Store on Williams Street - home to the RHSQ -Royal Historical Society of Queensland. (Qld oldest convict built building still in use - 1829). Proclamation Day is December 10th. ... the day it was proclaimed that QUEENSLAND WAS A BRAND NEW SEPARATE STATE !! the party still continues ! This fulfills a long term dream of mine . 2015 SOLO EXHIBITION"THE WAY BACK HOME"
GRAYDON Gallery, Merthyr Road, New Farm Brisbane. 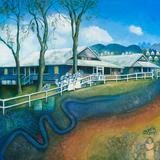 TATTERSALLS Annual Landscape Exhibition "150 years of Queensland"
Waterfront Place foyer, Eagle Street, Brisbane. "Charcoal and ink and pigment painting submitted this year. Time to research overseas and explore the Celtic and medieval influences in my work. Following in the foootsteps of medieval monks, romans and celts to scriptoriums and ancient gathering places. MONTVILLE 'S " MAIN STREET GALLERY"
(just below Poet's Corner Restaurant) . celebrating the humble Queenslander and character houses and our unique Backyard. Book available for purchase on-line - CONTACT ME for more details. Overwhelming attendance and response to the Artworks on display and the relaunch of Pam;s book "My Brisbane". ... the attendance and sales continued over the weekend... to the end of the exhibition. 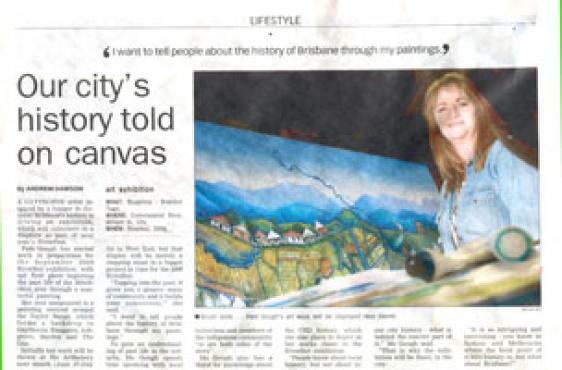 painting "Brisbane Patchwork" sells on first day. 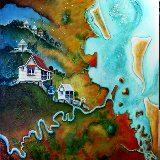 "Coast to Home" Fri. 14th Sept.
Pam was invited by the Pine Rivers Art Gallery to join a Group Exhibition with Randell Breen & Elisabeth Lawrence. Exhibition runs 1st June - 7th July at Pine Rivers Art Gallery, Gympie Rd, Strathpine. Hours Mon - Sat 10am - 4pm. I am thrilled to be the FEATURE ARTIST at the 12th annual "ARTSCAPE" EXHBITIION at PADUA COLLEGE. (Image: "Facing the Morning Sun - Wilston", 1 of 8 feature paintings available. "Living on Samford Road" is selected as a Finalist . July, 2011 Solo Exhibition "My Town"
ABC RADIO INTERVIEW BY KELLIE HIGGINS-DEVINE at the Munroodabin Bowls Club with Photographer Mark Lutz of Art House Reproductions & Annie and Artists who have come together to celebrate community in the aftermath of the floods. 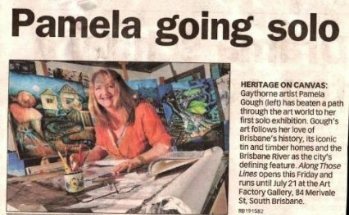 Overwhleming response to Pam's portrayal of Brisbane -bright, whimsical, intriging, positive yet thought provoking -her work celebrates Brisbane, past and present and asks us - What is left of our city's visual heritage. Thanks to all who love Brisbane. ART FESTIVAL ORGANISERS choose Pam's painting "SECOND STREET BACK FROM THE BEACH"
in the 20th Anniversary of the Art Prize. The painting now has a new home. Read Sandy Ludinski's article for Weekend Notes on my solo Exhibition "The Way Back Home". "U on SUNDAY" Full page Feature Article . 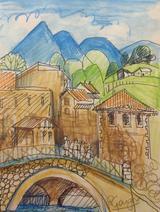 Rotary Spectacular Review ..." Commended - clever composition"
Article & Judges comments - Helen Grant (2012). March, 2012 ...THANK YOU to all those who supported ROTARY & CEREBRAL PALSY LEAGUE Qld) and the great work they do in our Community, at the recent ROTARY ARTS SPECTACULAR EXHIBITION Riverside Centre, Brisbane. 3 of my 4 paintings SOLD. Thankyou. A beautiful person, friend and inspiring artist. I celebrated today the first time the TOWER MILL on Wickham Terrace was opened to the public. Built in 1828, it is Brisbane's oldest convict built building. 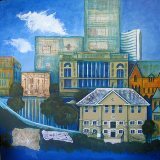 I have painted the Tower Mill again to record this day. My heart goes out to all those who have suffered during BRISBANE and Queensland's floods & cyclones... yet I feel blessed and inspired ... because the people, the generosity,the volunteers and spirits of Queenslanders have shone brightly ... for all the world to see. KEEP SHINING Queensland!